The body has an entire organ devoted to creating a protective barrier. This barrier, the human skin, is the body’s first line of defense against a world of harsh weather elements, temperature fluctuations, and bacterial invasions. Having quite the formidable task ahead of itself, our skin could use some assistance every now and then. 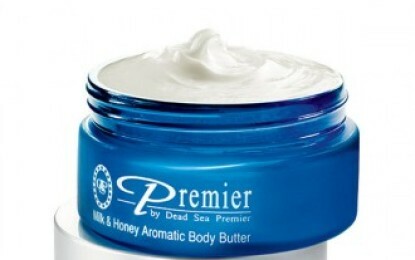 To prevent its drying and in order to maintain its original natural state of silky softness, Premier Dead Sea makes a wonderful Aromatic Body Butter. This luxury skin moisturizer produces amazing results when paired with the Premier Dead Sea Salt Scrub. Alone however, it makes one of the world’s best moisturizers. 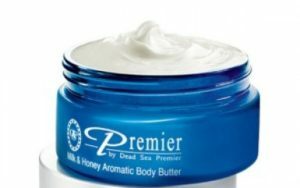 As a great addition to any beauty regimen, Premier Dead Sea Aromatic Body Butter works well with the entire Dead Sea Premier skin care line. To use, apply in circular movements onto clean skin. Best results are achieved right after shower or bath. This is a critical time when the skin needs to retain moisture. The body butter seals in the moisture and locks the skin’s hydration in. This can be particularly necessary to areas that often experience dryness such as elbows and knees. The Aromatic Body Butter comes in a variety of pleasant scents. All scents are very subtle, but also extremely pleasant and not a smell that will wear it’s welcome out quickly. These scents include Milk and Honey, Herbal, and Passion Fruit. The Body Butter is offered in a 5.95oz size and is a tremendous value. It is also a great way to be introduced into the Premier skin care line.